We woke at 5:30AM, and left the warmth of our sleeping bags to get ready for our climb. We donned hats and gloves as we ate our oatmeal, drank our coffee, and made final preparations to our packs. By 7:00AM we were ready to leave camp. Doug left a few minutes ahead of us to stash a bear bin with our dinner ingredients, stove, and fishing gear in the meadow between our climb and our camp. Despite Alex and Dave’s discontentment with the idea of heading down to the lake after climbing, Doug still stashed all the gear. We knew it was going to be a long day on the rock and would likely just want to get back to camp, eat, and sleep. Down the slabs and scree from camp and then over the meadow, and through the woods to talus fields we went. We found ourselves at the start of the south end of the ridge, but we were Doug-less. We decided to rope up and figured he would soon appear. 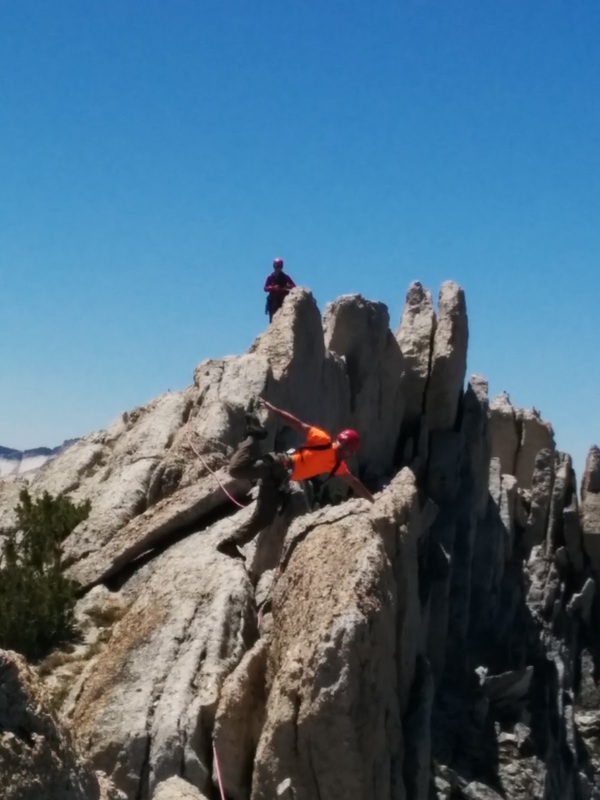 Almost on cue, we spotted him working his way up the talus field to us. 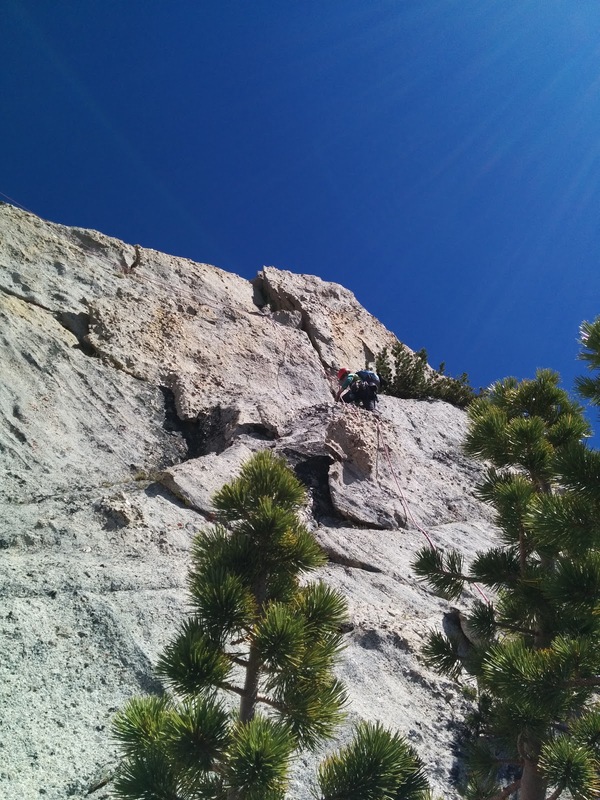 Alex put Dave on belay, and he started up the first of three vertical pitches to gain the ridge around 8:00AM. 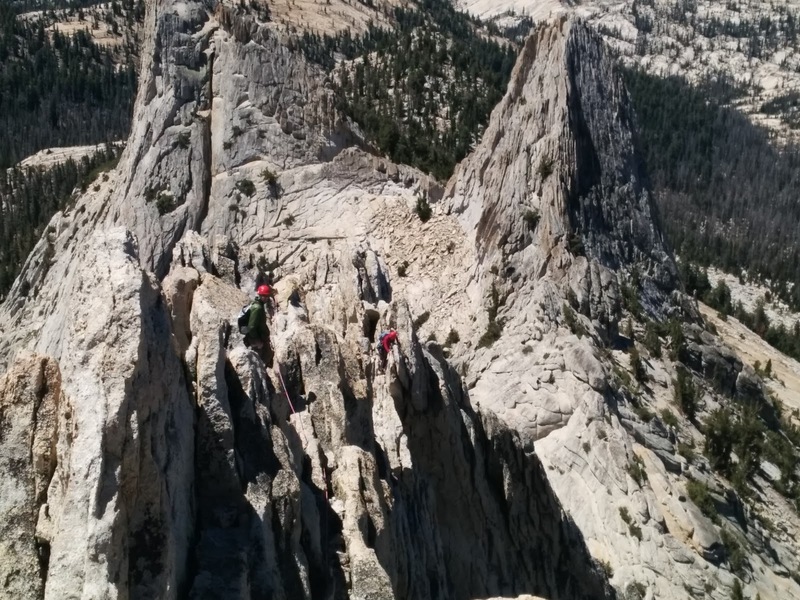 After gaining the 500 foot tall ridge via the enjoyable starting pitches, we began simulclimbing our way along the ridge, at times setting anchors to transfer gear from 3rd to leader, and at times putting each other on belay. 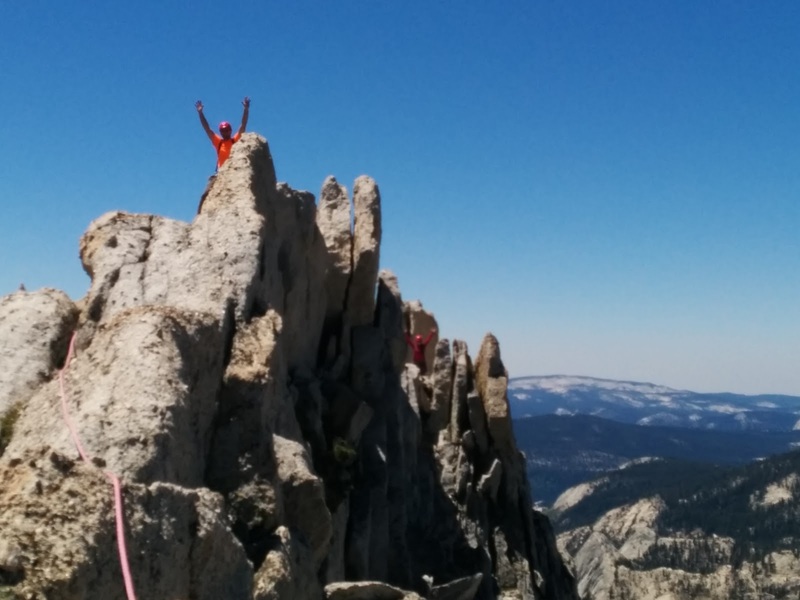 The climbing was awesome and provided amazing views, while being often exposed, exciting, and mentally exhausting. 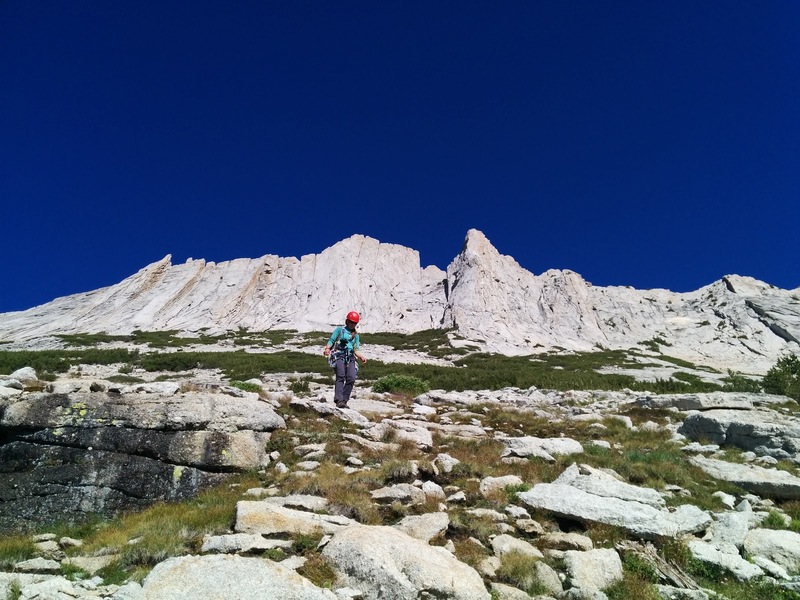 It was very different from our typical climbing; often finding ourselves having to down climb the rollercoaster ridge or navigate along the knife-edge ridge. LOOK, MOM! I USE SUNBLOCK! Around 2:00PM, we found ourselves in the vicinity of the North and South Summits. At the time, we were not sure if we had passed the South Summit, but spied some rappel stations below. The common descent point is the North Summit, but since we saw an out, we decided to take it it rather than continuing on to the rock ahead that looked sketchy. We were all tired and hungry, so we opted to downclimb to the first rap station below. Dave down-lead to the tree/bush rappel, followed by Alex, and Doug took up the tail cleaning the gear as he went. 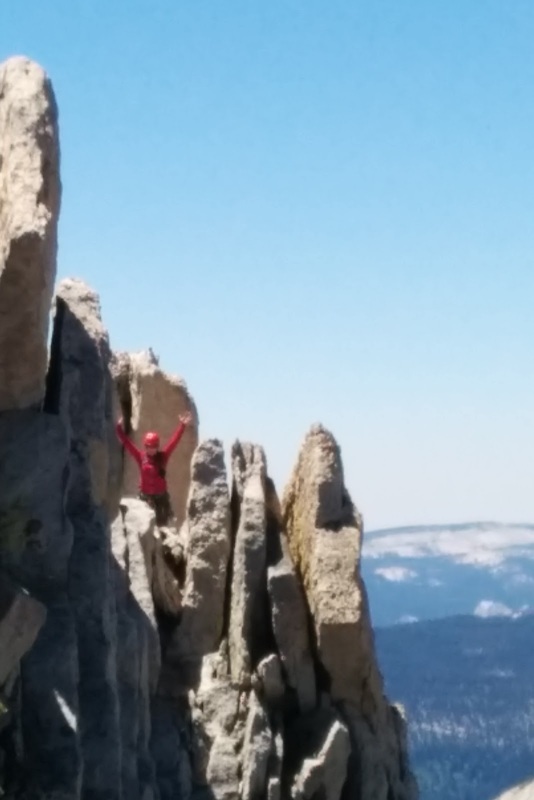 Two double rope rappels landed us all on the scree field at the base of the wall. We carefully navigated our way down the loose scree and into the meadow where Doug had stashed dinner. The idea of walking down to the lake to fish, and then having to walk alllll they way back up to camp did not appeal to our tired and hungry bodies, so we convinced Doug to start making dinner right there. It may have taken forever to make, but two hours later Doug provided us with a delicious, filling dinner or cream-chipped-bacon with potatoes, onions and garlic. Alex and Dave may have snuck a few pieces of bacon while the meal was in process, but what hungry person can resists a pile of freshly cooked crunchy bacon? As soon as dinner was ready, Doug retreated to sleep on a boulder without even eating. Apparently his stomach was angry with him for something he consumed. Meanwhile, Alex and Dave feasted on an adjacent boulder, feeling bad for Doug. He really must not be feeling well, who could resist this meal? After cleaning up the dinner dishes, and packing up all the gear, Alex and Dave woke Doug around 7:30PM, letting him know it was time to walk back to camp. He just wanted to lie there for a bit longer, so Alex and Dave gathered his gear and made their way back to camp with it. Though the walk was not far, after our long day, the uphill seemed brutal. As we cleaned up gear and prepared for sleep, a tired, pale looking Doug appeared. Fortunate for him, he was now ready to enjoy his dinner and was soon looking and feeling much better. Exhausted from our day, we all were in bed before sunset.